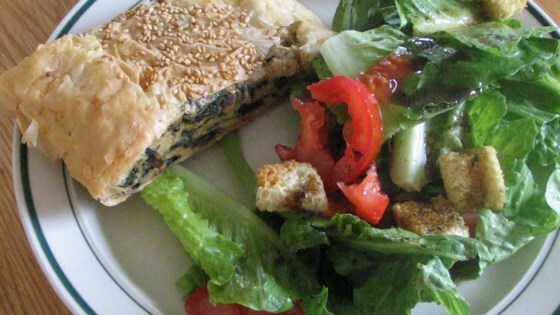 Phyllo dough layered with spinach and ricotta. Poppy seeds may be used in place of sesame seeds. Saute onion and garlic in oil in large saucepan until onion is translucent. Add mushrooms and spinach and continue cooking until mushrooms have released their juices and spinach has wilted. Continue cooking until liquid has evaporated. Remove from heat. Beat eggs slightly in large bowl. Add ricotta and parmesan, sour cream, bread crumbs and parsley to eggs. Drain excess liquid from vegetables, then add to cheese mixture. Stir until well blended. Brush some of melted butter on large baking sheet. Count out 6 phyllo leaves and carefully lift them up and lay flat on buttered baking sheet. Spread filling over middle of leaves, leaving a 3 inch border all around. Brush edges with butter. On top of the filling, lay down 2 leaves of phyllo at a time, brushing top leaf with butter each time. After 4 pairs, fold corners of all phyllo leaves up over filling, and brush with butter. Lay down 2 more pairs of leaves, buttering top leaf of each pair. Tuck edges under torta, corners first, then sides. Sprinkle top with sesame or poppy seeds. Bake at 375 degrees F (190 degrees C) for 50 minutes or until filling is set and phyllo is crisp and golden. Allow to rest 10 minutes before slicing. This recipe was time consuming but it was well worth it in the end. It was very filling and it had a great flavor. I will definetely make it again. The filling was very good but didn&apos;t think it went well with the flaky crust. This actually makes two packets. Very versatile - I used 15 oz. of ricotta inplace of the 1.5 c. ricotta 1 c. sour cream 1/4 c. dried parsley and it was still amazing. I thought it was very good a friend demands I make more. Four stars for the filling. I didn&apos;t like the phyllo pastry. I will make this again but probably in a pie case. I didn&apos;t have sour cream and used 1 1/2 cups of fat free riccotta instead. Great recipe -- made a really nice presentation for a meal with out of town guests and everyone loved it. Followed recipe for filling but substituted puff pastry for the phyllo and the recipe made enough to fill both puff pastry sheets so it made two tortas. - I put the filling down the center then folded each side over and pinched it together at the top pinched the ends together then brushed all with melted butter. They only needed to bake in the oven for 25-30 minutes and they puffed up and looked really beautiful. And YUM! Will be making these again. There was enough filling for 2 tortas. I really like the filling but mine was a little thin. I will cut out some sour cream and ricotta next time. Very easy to make. I made it without the mushrooms because I didn&apos;t have any. Tried it with less parmesan cheese and fresh spinach. I also had two round phyllo sheets placed one at the bottom and one on the top. 50 minutes later...Mmm!